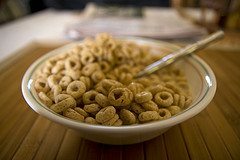 The Food and Drug Administration (FDA) is now classifying Cheerios —— those little round O’s made of oats that have been around since 1941 —— as a drug, and sent a letter to General Mills saying as much. Uhh, do you realize that this is a breakfast cereal made out of oats and modified corn starch? People eat it with milk, as a part of a balanced breakfast. My kids used to eat them by the fistful when they were babies. So does this mean that General Mills have been poisoning the entire world for the last 68 years, or is the FDA doing their usual bang-up job? The FDA’s biggest complaint, not including the one that no one takes them seriously anymore, is that General Mills claims that Cheerios can help lower bad cholesterol. Which means the FDA assumes the product is a drug. Which means General Mills cannot market Cheerios as they are, unless they apply for approval for a new drug, or changes the way it labels it. Look for the FDA to begin regulating exercise tapes and programs, gym memberships, and for the Drug Enforcement Agency to begin cracking down on Cocoa Puffs and Fruit Loops. Cap’n Crunch will be taken into custody, and the Trix Rabbit will be gunned down in a drive-by, with no clue to the shooter, other than a handful or orange stars, green clovers, and blue diamonds. This just in: Yogurt considered gateway drug. If Cheerios are now a drug what does that make Fruit Loops? HHmmmm… wonder what will happen when I put a Cheerio in my bong… gotta go. So when do we start seeing 420 Flakes in the cereal aisle? You don’t even want to know what Cheerios spelled backwards means. Omigod…now we’ll need the FCC, FTC, FAA, FDC and the FBI to investigate possible cereal crimes. I am so happy to be off teh Cheerios. That was a dark, dark time in my life. Older Article: A Brand New Liberal Radio Statio is Born… In San Diego! ?